So listen up dads…Mother’s Day is coming up and chances are, you are going to make the same old trip to the store to pick out some flowers, or heaven forbid bath salt! Or maybe you’re one of those guys that really wants to make his wife happy, but hasn’t got a clue what to get her. So, if you fall into one of these categories, you can stop stressing over what to buy and get your wife something that she will treasure forever, like pictures with her beautiful children. Mom’s are rarely ever in the pictures because they’re usually on the other side of the camera and I guarantee, you will make her a very happy woman! 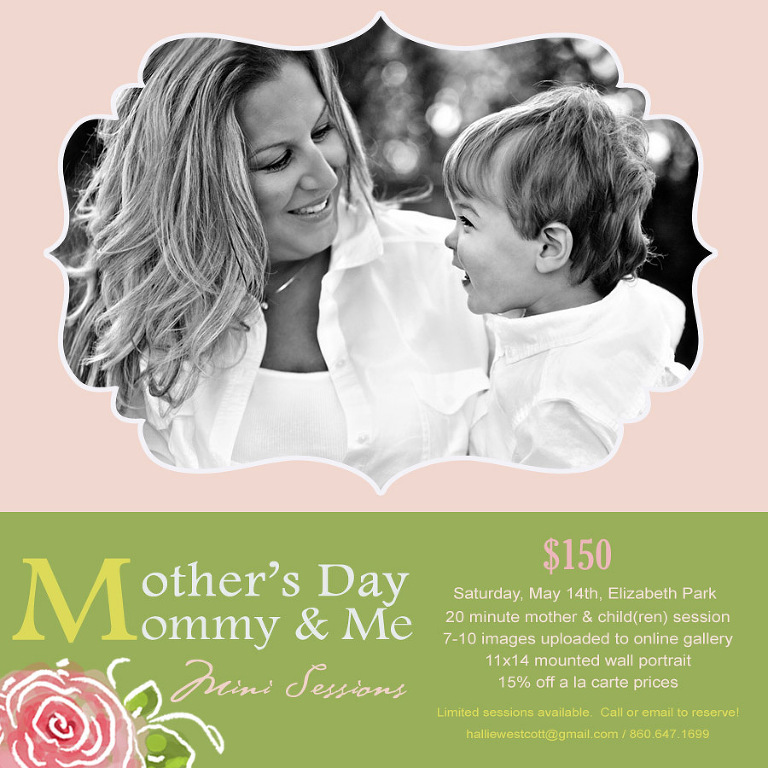 Mini sessions will be held on Saturday, May 14th, one week after Mother’s Day. Upon request, a special email announcing mom’s gift will be sent the evening before Mother’s Day. Mini sessions can include mom and up to 3 children, (each additional child $25.00.) A rain date will be announced upon booking. If you would prefer a full session for the occasion, I have a special for that too. Just send an email to halliewestcott@gmail.com and ask for details. I’ll get right back to you. So go ahead and book her session below, (you will thank me later…wink, wink) and feel free to request a time slot if you have one in mind.